I’ve been reading a bit about smartwatches lately, because I’m in the market for one, and a common theme seems to be that the current generation of smartwatches don’t offer enough value to be truly compelling. I’m a little surprised by this attitude; it seems pretty clear to me that smartwatches are at least as valuable as their analog counterparts, and that any additional functionality is just gravy. Clearly, though, many people aren’t looking at smartwatches the same way. I’m not sure if it’s a matter of style—today’s smartwatches are largely fairly geeky items that, well, look like smartwatches—or maybe the term “smartwatch” means to some people a device that replaces, rather than augments, a smartphone. 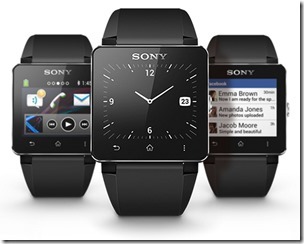 So, I thought I’d toss out my reasons for wanting a smartwatch, because I fully plan to purchase the Sony Smartwatch 2 the minute it’s released. I have a decent Bulova analog smartwatch that I used for a few years, but the band broke and I haven’t been able to replace it (and alternative bands just won’t work). Also, the face is a little scratched up, and the auto-wind feature became a little wonky after awhile. So, because I don’t like using my smartphone as my only timepiece—pulling it out of my pocket just to see what time it is becomes a bother, particularly when my hands are full—I’ve been planning to buy a watch of some kind sooner rather than later. Now, the question becomes: how much would I spend on an analog watch, were I to go that route? As I’ve looked at various options, I’ve found that my tastes have progressed over the years. While a $100 watch might have been fine when I was younger, I’m now actually attracted to watches that cost a minimum of $300 or so. That’s squarely in smartwatch territory (except for very expensive options like the Hyetis Crossbow), and any money spent on a smartwatch would be money I’m going to spend anyways. Much to my wife’s consternation, I’m not much for fashion and style. She’d rather I dress up a bit at times, but I’m fairly comfortable with a simple shirt and jeans. Maybe I got tired of worrying about clothes after six years spent as a sales engineer for Ricoh, where the dress code was pretty simple: anything goes, as long as it’s a suit. And so, while style would certainly be a criteria for any analog watch I’d buy, that’s not my driving factor for buying a timepiece in general. I’m more than happy to buy a device that’s a bit geeky, as long as it offers some basic additional functionality. Fortunately, the Sony Smartwatch 2 seems decent-enough looking. The smartwatch itself is neutral enough that any standard 24mm band (which Sony was smart enough to support) can be utilized for a little flair, without clashing. Because my single most important reason for getting a timepiece is to tell the time (which seems obvious, but isn’t really when considering a smartwatch), my smartwatch needs are really very simple. I want a smartwatch that, first and foremost, will function by itself as a watch with time and date functionality. Any other standalone (i.e., not connected to a smartphone or tablet) functionality is just icing on the cake for me. As far as connected functionality itself goes, I’m happy with a device being just an extension of my smartphone or tablet. I’d like to get notifications so that I know whether a call, text, email, or whatever is important enough to pull my phone out of my pocket. I’d also like some simple controls, like pausing music or skipping to the next track (volume control is optional), accepting or refusing a call, and perhaps triaging email and Twitter feeds. Other functionality, like tying to an exercise app or checking the weather, would be nice but not necessary. I don’t care at all about using the phone to receive or make calls, in the sense of having a microphone and speaker/headphone jack, and I certainly don’t want it to be an actual cellular device all by itself. And please, no camera, although the ability to control the camera on a smartphone and use the smartwatch to click the shutter is interesting. Fortunately, the Sony Smartwatch 2 fits this bill almost perfectly. It also has about 400 apps available already, with hopefully more on the way. As far as I can tell, the Sony does everything I want, without doing anything I don’t want, meaning that it should perform well and enjoy good enough battery life. Oh, and I should mention, I would never buy a smartwatch that’s tied to one manufacturer’s line of devices. Samsung, I’m talking to you here: the Galaxy Gear is a nonstarter for me, because I have no intention of buying a Samsung smartphone or tablet in the near future. I live in Southern California, and the number of cloudy days in a given year can usually be counted on one’s fingers and toes. Maybe a few more, but you get my meaning. Basically, if I’m outside, it’s almost guaranteed to be sunny, and so any device I use should be viewable in direct sunlight. This is why I’ve disliked Samsung’s various AMOLED smartphones, which have had generally terrible outside viewability, and why the Pebble, Qualcomm’s new Mirasol-based smartwatch, and the Sony Smartwatch 2 are attractive to me. However, I also like reasonably bright colors and quick responsiveness, which seems to favor Sony’s transflective LCD. In short, a smartwatch is for me a watch first that then extends the functionality of my smartphone or tablet. The Sony Smartwatch 2 seems like the best option because it offers precisely the functionality I’m looking for, easily pairs via NFC with different Android devices (so I should theoretically be able to switch back and forth between my tablet and smartphone without too much hassle), supports a variety of standard 24mm bands, and should offer decent enough battery life. If that’s not enough functionality to justify $300 or so, which is what I’d pay for an analog watch (at least), then I don’t know what would qualify. I’m hoping the Sony Smartwatch 2 is released this month at around that price, or less, so that I can get my hands on it soon and see if I’m right. Let me know in the comments what you’re looking for in a smartwatch, or if you’re looking at one at all.